It was a great two days in Kamloops attending both the Regional Governance Council Meeting and the first MNBC Regional Information Session in Kamloops this past weekend. Notable was the announcement of the re-election of Melanie Allard as President of the Two Rivers Metis Society and the RGC appointment of Shaughn Davoren as the Thompson Okanagan Region Interim Youth Representative, congratulations to you both. It was standing room only on Saturday at the Holiday Inn to listen to the presentations from MNBC Staff on each of their roles and responsibilities. Many questions were voiced with the presenters providing informative answers. Thank you to everyone that attended. The two pictures below are of the attending RGC members. Absent from the photo but did attend are Leo Brazeau and Dr. Marlene C. Bishop. Shaughn is present in the back row of the photo. 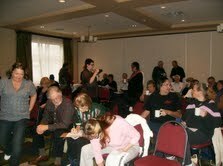 The other photo is a snap shot of some ot those attending the Regional Information Session prior to its start. « Welcome to the New Board of Directors B.L.M.A.